Why stick to old fashioned food preparation methods when there’s all sorts of new and exciting techniques to try out? 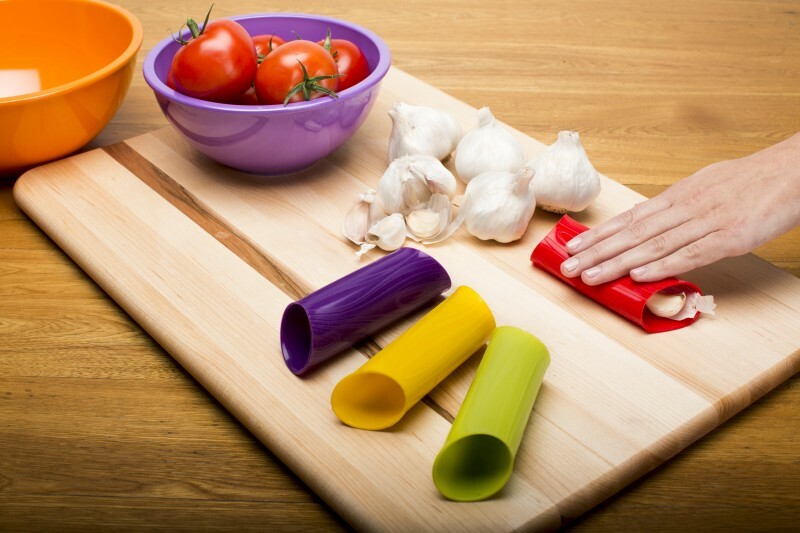 Fruit and veg gadgets can help you to speed up your cooking time this summer (no one wants to be stuck in the kitchen when the sun is shining! ), encourage you to eat healthier, liven up a dull meal rotation, and even help transform your kitchen with the latest equipment. So just what are the 6 ingenious fruit and veg gadgets you’ll want to have to hand this summer? Avocados may not be an official ‘superfood’, but they should be! Full of essential fats and oils, avocados can be great for bringing back a little shine to your hair if it’s been damaged by the summer sun, and it tastes good, too! The only problem is that it can be a little time consuming to prepare. 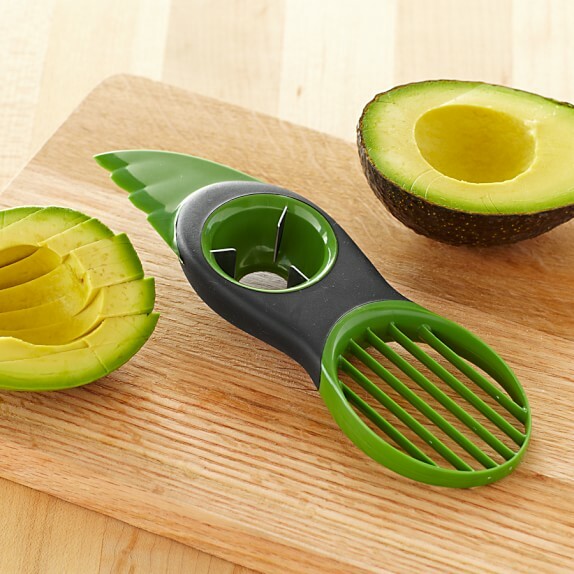 What you need is an avocado slicer, which either slices or cubes the flesh while it’s still in the skin. Sliced avocado is ideal for adding to a healthy summer salad, while cubed avocado adds a lovely creaminess to chicken fajita wraps. One of the latest trends in the healthy eating world is to replace stodgy carbs like pasta and noodles with a healthier alternative – like spiralized veg! 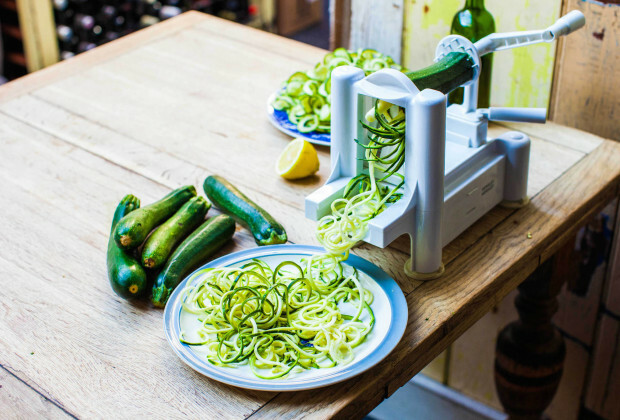 Veggie spiralisers are essentially a huge pencil sharpener designed for everything from carrots and cucumber to cabbage and courgette. Mix with other veggies and add a healthy tomato sauce for a lighter pasta alternative for the summer. Just remember to keep your fingers away from the blade – these little gadgets may be small, but they’re mightier than you may think! It may be a strong flavour, but garlic is great for keeping those summer colds at bay so you can make the most of the warm weather. But let’s be honest – there’s not many ingredients that are more time consuming to prepare than fresh garlic, and pre-prepared garlic just doesn’t have the same oomph. Silicone garlic peelers are the answer. Simply pop a clove in, and use your hands to roll the garlic inside the tube-shaped peeler. The skin will be gone in seconds, so all you have to do is grate, slice, or dice. Full of Vitamin C, oranges make a great snack, but they can also play a very important role in cooking, too. From orange wedges tossed into a summer salad to orange chicken, there’s plenty of ways to incorporate oranges into the diet. But even oranges that are marketed as ‘easy peelers’ can leave us ready to pull our hair out! 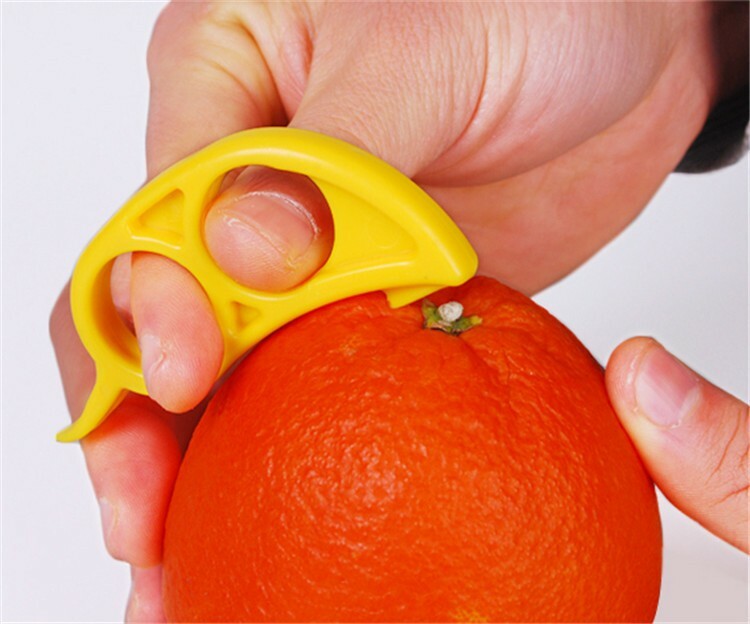 An orange peeler sits on your finger like a ring (a new summer fashion statement, perhaps? ), helping you to score the skin and making it much quicker and easier to peel. Love snacking on fresh cherries in the summer but hate dealing with that annoying pip in the middle? 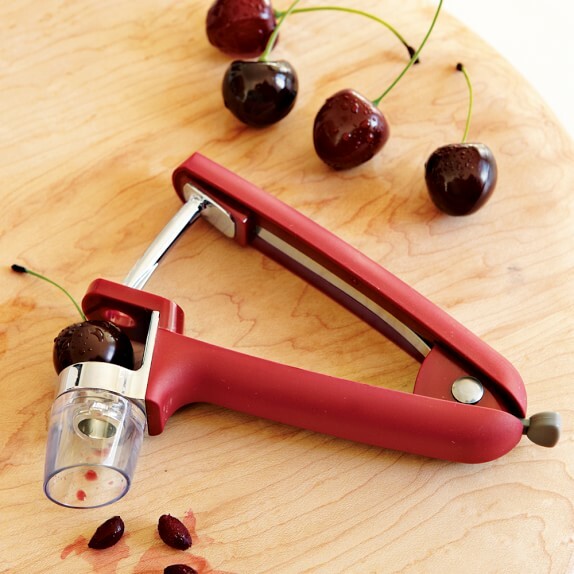 Then what you need is a cherry pitter. It may look like some sort of medieval torture device, but what it does is push the stone through the cherry, leaving you with a pile of pip-less fruit. If you’re thinking of making a summer sangria, add a handful of de-stoned cherries. They’ll look great in the jug, and you can serve to friends and family without worrying about those bothersome little pips getting in the way. Nothing spells summer quite like fresh strawberries, but eating around the green leafy part at the top can be a bit fiddly – not really what you want on a relaxing summer’s day. Strawberry hullers are a quick and easy way to prepare your strawberries so that they’re ready for eating. 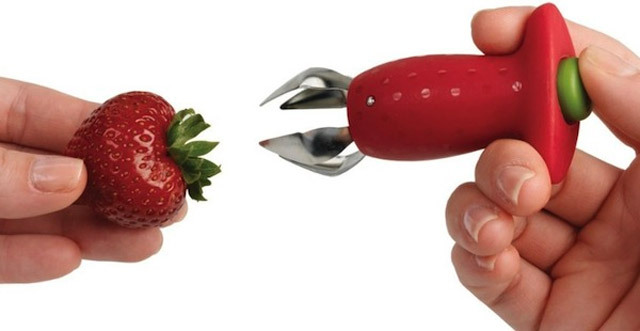 The huller gently pulls away at the top of the strawberry, minimising wastage and ensuring your fruit remains intact. You can even get strawberry slices – which look a little like boiled egg slicers – to further speed up your fruit preparation. These 6 fruit and veg gadgets are great for honing your preparation processes this summer, but as they’re the ‘in thing’ right now, some can be quite costly – especially branded gadgets. Luckily, there’s some great cost-effective alternatives out there for super speedy fruit and veg prep, and you probably already have everything you need at home! Try de-stemming strawberries by pushing a drinking straw through the middle to pop the stem out. Have a go at de-stoning cherries by resting the cherry on the neck of a plastic drinks bottle and pushing a chopstick through to pop the stone out. Or peel garlic by putting it inside a box and giving it a vigorous shake. It may be an unusual technique, but it works!